It's Monday again. These weeks sure do fly by! Thanks for stopping by! I hope you had a great week of reading last week. I finished a very good book: Last Snow by Eric Van Lustbader. This is a great thriller with lots of twists and turns. Be sure to enter my giveaway! It ends on Wednesday night. I didn't get a chance to post a lot last week, but I did put up my weekly What My Children Are Reading recap. I hope to have a few more reviews and posts this week. SYNOPSIS: In the bitter conflict over the Holy Land, two generations of families—one Israeli and one Palestinian—fight for their survival and their own piece of the Promised Land. The story focuses on one member of each family: Ellie Liebowisc is a Holocaust survivor who comes to Israel after being liberated from a concentration camp and Yasif Assad is a young Palestinian who is studying in America and struggles to reconcile his love of the Holy Land and his sense of betrayal when the state of Israel is formed. Yet, both Ellie and Yasif are fighting to find their piece of the Promised Land. Underneath this bloody struggle runs a current of hope and a belief in the possibility of a peaceful resolution, but the unending cycle of violence threatens to prevent such a resolution. LOve the cover on Our Promised Land. I will be interested in your review of this one. That is a beautiful cover on Our Promised Land. Wench is getting great reviews so hope you enjoy it too. Wench is on my TBR list. Love the cover for it! Wench and Our Promise Land sound really good! Thanks for the author's link..Have a great week. Last Snow sounds great - I might have to enter your giveaway. 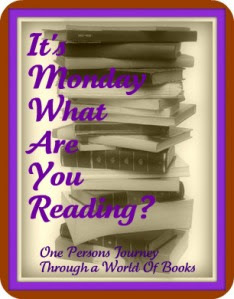 Hope you enjoy all your reading this week! The cover of the Promised Land is nice. Sounds like an interesting story. Can't wait for the follow up.